Step 1. Assemble two Horizontal Pole by putting together 2 x (A1) and 2 x (A2) into one Horizontal Pole (A1plus A2). Step 2. 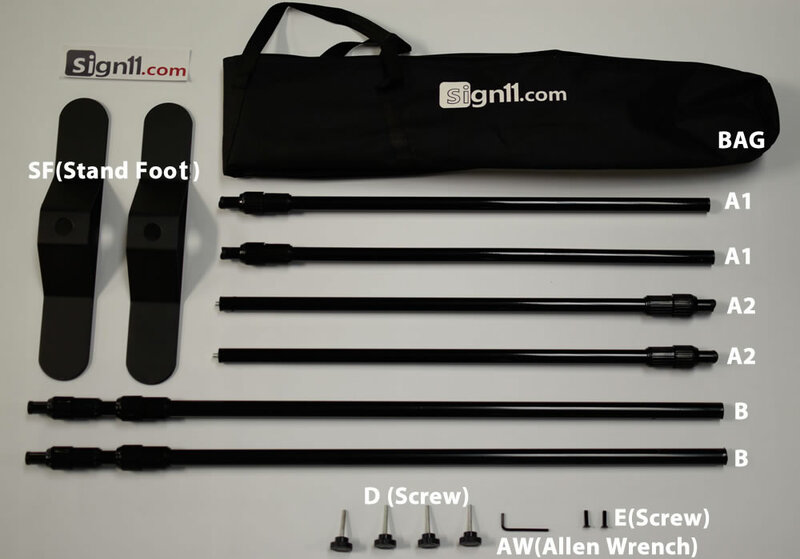 Insert Vertical Pole (B) into the hole on top of the Stand Foot (SF) and secure the Vertical Pole (B) with the Bottom Screw (E-Screw) using the Allen Wrench (AW). Repeat this step to assemble another set (B plus SF). Step 3. Lay down your Backdrop at the desired display location. Step 4. Place each Vertical Pole with Stand Foot (B plus SF) at the either side of your Backdrop. Step 5. Extend the Horizontal Poles (A1 plus A2) as wide as your Backdrop by loosening the knobs. Once extended, secure the size by tighening the knobs. Step 6. Insert the Horizontal Pole (A1 plus A2) into the top pole pocket of your backdrop. Step 8. Extend the upper part of the Vertical Poles (B) by loosening Should Level Knobs (Ba). DO NOT Extend all the way but leave about 1” of the Pole inside. Secure by tighening the knobs. Step 9. Insert the remaining Horizontal Pole (A1plus A2) into the bottom pole pocket of your backdrop. Step 10. Adjust the height of your backdrop by loosening the Hip Level Knobs and raising the Middle Vertical Pole. Secure the height by tightening the knobs. Step 11. Secure the bottom Vertical Pole (A1 plus A2) using the remaining 2 x Knob Screws (D-Screws). Step 11A. For those who have Side Grommets on the Backdrop Only! Using the zip ties provided, secure your backdrop to the vertical poles of the stand. Step 12. Adjust the backdrop using the Hip Level Knobs and Vertical Poles.